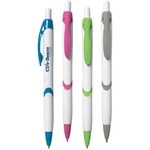 Your logo will stand out on this Super Grip Metallic Promotional Pen with extra large barrel. A wonderful executive gift! This Cross Century Black Lacquer Custom Roller Ball Pen has been around since 1946 and features and elegant black lacquer finish. These bold colored custom pens are a great take away item from trade shows, seminars, corporate events and more to give your brand widespread promotion. Promote your event and your brand in colorful style by handing out these BIC Rize Grip retractable pens imprinted with your custom logo at your event.